The founding of Cornell University brought together all of the themes that were important in Ezra Cornell's life: his deep and abiding concern for education, his interest in agriculture, his philanthropic impulse, and his political sense. The opportunities also were there. In 1862 the Morrill Land Grant Act had been passed, appropriating public lands to aid state agricultural and mechanical colleges. By 1864, Cornell's family, his personal philanthropies, and the Public Library required only a small part of his considerable fortune. He had been elected to the New York State Senate, where he made the acquaintance of Andrew Dickson White of Syracuse. Through discussions with White, the idea of a university grew in Cornell's mind. When the Legislature met in 1865, White introduced a bill in the Senate "to establish the Cornell University and to appropriate to it the income of the sale of public lands granted to this State." After much political maneuvering, the bill was passed in the Assembly on April 21, in the Senate on April 22, and was signed by Governor Reuben E. Fenton on April 27. The first meeting of the Board of Trustees was held on April 28. Cornell endowed the university through an outright gift of $500,000, to which would be added the sum realized by Cornell's purchase of the Morrill land scrip from the state. 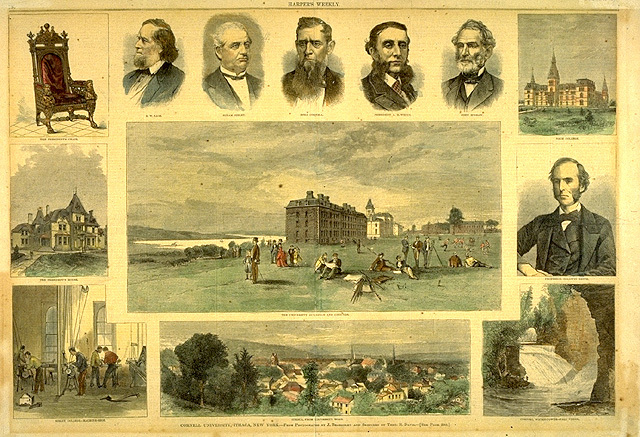 Cornell was closely involved in all aspects of the new university. He superintended construction and purchased equipment, books, and collections. On October 7, 1868, Inauguration Day, 412 students, the largest entering class admitted to any American college up to that time, came to Ithaca. Cornell gave a brief address, concluding with the University's newly adopted motto: "Finally, I trust we have laid the foundation of an University--an institution where any person can find instruction in any study." Ezra Cornell to Mary Ann Cornell, Albany, August 4, 1866. The struggle is over at last and I have just mailed 200 pieces of land scrip to Mr. Woodward and have written him that we will start for the west by Tuesday the 14th.... I now feel for the first time that the destiny of the Cornell University was fixed, and that its ultimate endowment would be ample for the vast field of labor it embraces, and if properly organised for the developement of truth, industry and frugality, it will become a power in the land which will controll and mold the future of this great state, and carry it onward and upward in its industrial developement, and support of civil and religious liberty, and its guarenty of equal rights and equal laws to all men. Ezra Cornell to Mattie Curran. Ithaca, July 24, 1869. There is a great reform required in the education and habits of females. Please study the subject and see what can be done for them. Respectfully yours Ezra Cornell. Malvina Higgins to Ezra Cornell. Maryville, East Tennessee, October 19, 1869. Mr. Cornell will permit one who has been teacher among the Freedmen in different states, to thus tax his valuable time with a note of thanks that he does not exclude colored persons from the benefits of his University. Seeing the universal horror with which such a suggestion is received in our schools at the south, and yet seeing that "Cornell" has become a subject of interest among the intelligent of these places far beyond my expectations, even, we can but regard this step in your institution as greater than a political victory--and an important aid in re-construction, notwithstanding the fact that a few northern colleges have thus done. That such an institution as yours has taken this step in recognition of the brotherhood of man seems to be of special consequence just now.... It is with pleasure, that on returning to East Tennessee, where this Maryville College has struggled so hard, I am able to say that the beautiful University which graces my home has taken this step. The Cornell University Register, 1868-9. Printed for the University at the Office of the Ithaca Journal, 1869. 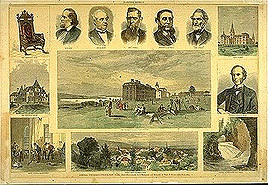 The University officially opened on October 7, 1868. Inauguration ceremonies, held in the Cornell Library, included a brief address by Ezra Cornell. Lieutenant-Governor Stewart L. Woodford administered the oath of office to President Andrew Dickson White, and speeches were presented by White and others. I hope we have laid the foundation of an institution which shall combine practical with liberal education, which shall fit the youth of our country for the professions, the farms, the mines, the manufactories, for the investigations of science, and for mastering all the practical questions of life with success and honor. I believe that we have made the beginning of an institution which will prove highly beneficial to the poor young men and the poor young women of our county. 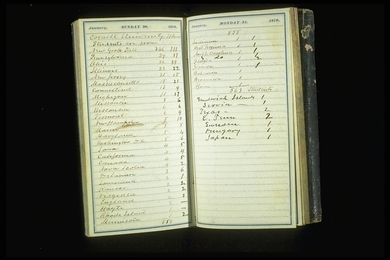 Ezra Cornell's Pocket Diary. 1870. 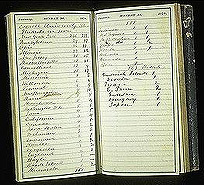 The diary includes notes, accounts, drafts and copies of letters, as well as a list of "where students are from." In 1870 there were students from twenty-eight states, Washington, D.C., and eleven foreign countries. Ezra Cornell to "The coming man and woman."